I am in the process of building from scratch a pair of vertical cooling fans. These will have a 10" diameter fan and will look basically the same as the original Charlie Clark fans I have been modifying. But instead of the fan housing being cast aluminum, these will be billet and fully machined and welded. One is already sold and the other will be available. The shroud will be carbon fiber instead of fiberglass with a more contoured shape. The CF will be a lot lighter than fiberglass. My Custom aluminum cooling fan for the Charlie Clark Vertical fan assembly. 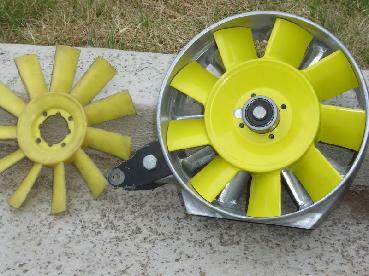 My fan replaces the simple yellow plastic Austin Healey fan originally supplied with the Clark kit. Designed after both the Porsche 911 and 935 fans, this fan incorporates 9 wider, more aggressive blades with the center hub built to fit the late model Corvair fan bearing. In order for my fan to work with the greatest efficiency, I also modify the fan housing by adding stator blades to the housing and modifying the original 3 supporting spokes. 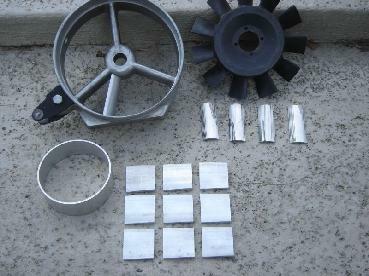 The original spokes greatly restrict and disrupt air flow into the fan shroud. The new stator blades allow the air to move freely off the fan blades and help straighten the air flow into the shroud. Soon to follow will be a new aluminum drive pulley with all the same dimensions as the original Corvair smog pulley but with a larger outside diameter. This is needed to drive the fan at a more optimum speed for proper cooling. The next fan series will be a carbon fiber unit w/ aluminum center section. I am working on the molds now. A new custom carbon fiber shroud is also available. 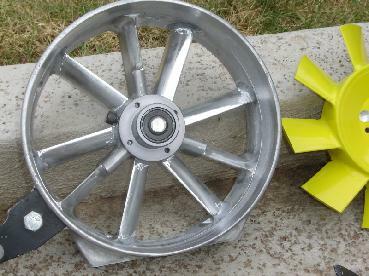 Pricing for the replacement aluminum fan with stator mods on your housing is $950.00 plus shipping/handling. If interested, please contact me for more info. Above are 2 pictures of Dan Gianotti's engine in his GT-3 race car. He is running the vertical fan with my upgrade aluminum fan. I powder coated both the fan and housing gray.